This is a script of the talk Dr. Wang has delivered to Christian churches and groups. I would like to first speak briefly about China, the Chinese Cultural Holocaust, and Christianity. I will talk about China and describe the cultural holocaust, the status of Christianity in China, and I'd like to tell you how I became a Christian, and the two lessons that I've learned in life through being a Christian. The first lesson is, God does have a plan for each of us, even though the plan may not be apparent to each of us at the time. The second lesson I'd like to share with you is God has created this world without contradiction. It may appear to be contradictory to us at times, because we don't know better. So His challenge to all of us is to keep the faith, work hard, do our part, and always firmly believe that He will reveal Himself to us if we truly believe in Him. China is the size of the U.S. with a population of 1.4 billion people. They have done computer composites where if you take people's features from around the world and decide what the people of the world look like based on percentage of population, for some reason, that composite person looks suspiciously Chinese. In China, the main philosophy is based on family values, balance and harmony. As you know, in the last 20 years there has been explosive economic development: “the China miracle.” I will speak briefly about what this means, that it is a historical opportunity for Christians to expand our influence and capture a country that spiritually is at war right now. I'll show you a few slides which include pictures of traditional dress, ancient astronomical inventions, and the Great Wall. The Great Wall of China was built 2000 years ago by the 1st emperor of China and is the only man made structure visible from space. If you connect the bricks of the great wall it can go to the moon and come back seven times and it goes across 2/3 of china horizontally. It is amazing how they can build this structure on the tip of a mountain. It shows the industriousness and hardworking attitude of the people. (A picture is shown of the Forbidden City.) The Forbidden City in Beijing was built for one man - the emperor. It is like the Vatican but bigger. It housed one man, and several thousand young ladies and several thousand men who really were not men, but eunuchs, because the emperor wanted to keep himself the only man. (A picture is shown of a dragon.) The dragon is symbol of influence and power in Chinese culture. (A picture is shown of performers in full costume at a Chinese opera.) Chinese opera is characterized by symbolism and much like western opera it is not so much the storyline or how fast it will go, the point is about the depth of human feeling. (A picture is shown of Southern China.) The southern part of China is very peaceful with the Li River, which inspired several ancient poets. (A picture is shown of the Terra Cotta Warriors.) The first emperor of China, 30 years before he died, 2000 years ago, decides that he wants to be protected after his death, so he mobilized one third of China for 30 years to build a big tomb and 7,000 clay soldiers, each of them with different facial expressions. The aim of all these 7,000 soldiers was to protect the emperor, after his death. I want to talk about the Cultural Revolution, or cultural holocaust. It is unfathomable for us in the West. We have difficulty understanding genocide, Hitler, and many other things that are beyond normal human comprehension. From 1966 to 1976, for ten years, the Chinese government decided that the best way to keep rule and order as a dictatorship was to destroy the country's youth. For ten years, the Chinese government initiated a policy to condemn every high school graduate and junior high graduate to a remote part of the country; to deport them and condemn them to a life of poverty and if one escaped back to the city one would be jailed. Twenty million youth were deported and their futures were destroyed for a ten year period. College entrance examinations were all stopped for ten years. This just shows that when there is no democracy or spiritual guidance for human behavior, humans can sometimes really go crazy - such as the few examples I mentioned earlier. Interestingly today, if you were to go to China you would see in business there are people in their thirties and early forties and sixties and seventies. There is a missing generation of those in their late forties and their fifties. These people are simply not there. There is a missing gap because when they graduated from high school in the 1960's, they were deported and their future destroyed and most of them were never heard from again. I was caught at the end of the Cultural Revolution. I was 14 and a straight A student and the Chinese government told me and the rest of the junior high school graduates that we would be deported. The only way to escape this devastating fate was to have some kind of talent that the government would still find useful, such as playing a musical instrument, because the government still had propaganda troupes which needed musicians. That is why I picked up the Chinese violin. It is now a hobby. My most recent adventure involved playing with Dolly Parton while she sang. The CD came out already. It is a beautiful East-West combination. It is a hobby now, but then it was for survival. The Chinese violin is a two stringed instrument with a bow that sits between the two strings. It is amazing how simple the instrument is because the bow can only hit one string at a time. There is a contrast between the simplicity of the instrument and the dynamic range of the emotions it can express. So then, when I picked up the instrument it was for survival. The Communist government discovered my little plan, and blocked musicians halfway. My parents were both doctors in medical school at that time. Their medical school was shut off except two classes, so they smuggled me in as an illegal student and I asked my father, "Why do I need to study medicine without any chance of becoming a doctor since I will be deported?" My father said, "Knowledge will always be useful," and to this day I still remember what he said. So the government discovered this illegal student in medical school and kicked me out. At age 15, again I faced deportation. Then I met a young man whose father was executed for writing a play against the government. He was a very talented poet. We got together and I taught myself music composition. We wrote many pieces together, though the government would never allow us to publish our work. One of the pieces we wrote was "Prisoner's Song." It expressed our longing for freedom and meaning and a future that was better than condemned labor. In 1976 the proletarian leader died, and China realized what a tragic mistake it had made by destroying its youth for ten years. That is when I had to skip the entire senior high school and go straight to college. The way I came to America was that in my junior year of college there was going to be a visit by an American professor, and I had a little plan. I wanted to go to America, but my parents were earning like six to eight dollars per month, so there was no way that they could support that. So, the night before the professor's arrival, I pulled out my English textbooks and I studied. The next morning, he gave a lecture, and at the end he asked if there were any questions. I raised my hand very high amidst a few hundred Chinese students, all very quiet and disciplined. He said, "Yes," and I asked him a question straight out of the textbook that I had studied the night before. The question was, "What is the academic load of your school?" He said, "What do you mean? Can you explain?" That is when I realized that I had practiced a question without practicing how to listen to a question. So, I ended up repeating and repeating the same question with no clue what he was saying. Finally, he did figure out what I was saying. As it turned out, I did study an English textbook the night before, but it was a British English textbook. In Great Britain the "academic load" means the number of credits an undergraduate is supposed to have to graduate. In America we would probably describe it more specifically. He did figure out what I was saying and he explained the answer, though I didn't understand what he was saying. But I did get to ask my question and that was my plan. Before he left the podium he pointed at me and said, "That student. I want to see him in America," because he was impressed by my persistence - asking him the same question ten times. In 1982, I was dropped off, alone, at the National Airport in Washington, D.C. I had $50 dollars (borrowed), a dictionary, and an American dream, knowing no one in this country. Christianity in China. There are about 70 to 100 million Christians. Historically there was an opportunity for Christianity to really, truly exert its influence in the Yuen Dynasty, the 13th century around the time of Marco Polo. The Pope sent 4 priests to China but they turned back halfway through the journey because of how difficult the journey was, but there would have been an opportunity if they had persevered. Today, most of the Christians in China can now pray openly, fortunately. Only a few years ago one would have to pray underground. The government made very strict rules that you cannot talk about politics. Today despite its economic development, the Chinese people need spiritual guidance and a moral compass. With the falling of the Berlin wall and the crumbling of Communist ideology we all know it doesn't work, so there is a spiritual vacuum at this historical moment, for Christian brothers and sisters around the world, to venture into China to spread the word of Jesus Christ. I have been involved in translational work for the 7th Bible in Chinese. My contribution was trying to influence them to make the new translation in modern Chinese in order to truly influence the younger generation. The language used today is very different from what used to be, for example, the word "attachment." You might say something like "emotional attachment" but a young person would say something like "I'll send you an attachment." That has different meaning. So only by capturing the language of our time, in translating the bible, can we truly capture the younger generation. How did I become a Christian? I was not born one. I was not one when I came to the United States. So, I searched and searched about things in life through science, and it is interesting that the more I studied, the more I realized how little could be explained. So I really got into an emotional and moral crisis. What is the answer? I thought the more I studied in science the more I would know. It is very important that one have a good mentor in life and at that point there was a professor who I respected greatly for his scientific knowledge. He took me out to lunch one day. He knew that I was struggling about the increasing inability of science to explain things and he said, "Ming, what is that over across the street?" I said, "That's a car." He said, "What is the difference between a car and a human brain?" I said, "A human brain is much more complex." And he said, "Do you think a random collection of scrap metals could assemble itself into a car?" I said, "No way!" He said, "How about the human brain?" I said, "That is even much more unfathomable." He said, "You understand my point." This professor really opened the door. Stanley Hand was his name. He really opened the door for me to look into an entirely new world that I was not familiar with. Through years of studying, watching and observing friends who had walked with the Lord much longer than I had, I've learned much and I still have much to learn, but I feel that we can find answers. So my having become a Christian has to do with coming with a question and trying to find the answer. Two lessons I have learned as a Christian. One is: God does have a plan for each of us, even though at the time it may not be apparent to us. So, for example, if I look back on my life at age 14, a straight A student, longing for a happy life that was so tragically cut off like 20 million others that faced the fate of deportation and a lifetime of misery - Why? What is the purpose of that? I did not understand. Also, at age 21 coming to this country, not knowing anyone, penniless – I asked, Why did God take me all the way to the other side of the globe? What's the purpose? In 1997, I finally finished my schooling and training after 31 years (because I got two doctoral degrees, one in laser and one in medicine), and got a job at Vanderbilt which was my first job ever. I was director of the whole Laser Sight Center, and it was a great job, an offer too good to refuse. I moved to Nashville because of that job, and I continue to make Nashville my home. So what is the purpose of all these prolonged years of schooling? At the time it was not clear to me, why 31 years? Now I have begun to catch a glimpse of the wisdom of God, because He does have a plan for each of us. In my case, I began to understand that, perhaps, by allowing me to go through these devastating miseries at the young age of 14, and the uncertainty and pennilessness of coming to a vast new land, God truly wanted me to appreciate what I have here today. Sometimes my friends will say, "Ming, how do you have time to do all that you do," and my answer is, "God and passion." You have to be passionate in what you do and believe God has a plan. Also, after all these years of training I understand that modern medicine is a combination of medicine and technology. You can only truly deliver the best care to your patients if you truly understand the high tech medical technology, like lasers. A laser cannot just be a “black box” to a doctor when you are talking about someone's vision for the rest of his or her life. So, at the time it was not clear to me, but now I realize the wisdom of God wanting me to serve my patients better by knowing medicine and also science and high technology, so I can combine the two to deliver true, modern quality care. So God does have a plan for each of us, it may not be apparent at the time, but we have to trust that He does have a plan. I want to show you one example in medicine, where I've been personally involved in research, to illustrate this point that God has created a world without contradiction. The question involves embryonic stem cell transplantation. Do we do research on stem cells? And what about the embryo; they are human lives. Do we not do research? Then the next time we get an infection we shouldn’t use antibiotics because those were the fruits of research. How can we resolve this conflict? What was God's original intention for us as human beings - with relation to this example of stem cell research? What should we do? How do we find a moral compass to guide how we should deal with the stem cell issue? For example, this picture (on screen) is of an eyeball with blindness that is due to trauma, which is largely incurable today. It is because the human being was scarred in the healing process of injury. So I started a line of research with a field of researchers from Harvard 20 years ago - to find out how we can find a solution to restore sight by preventing scar formation. We then came upon the phenomenon of fetal wound healing - that a fetus inside its mother's womb before birth has the ability to regenerate. An unborn child can heal without scars. It is interesting, that the time when I learned this, I was a Christian already, so I asked my God why he created things that way - for an adult to heal with a scar but a fetus without. I gradually realized that in an adult world, if you get cut, your priority is to heal quickly to prevent infection and bleeding. The price you pay for the speed of healing is disorganization or scarring. If the same injury happened to a child inside his mother's womb, there is no hurry. It is a sterile, fluid environment where the baby can heal, taking all the time it needs, so the baby actually has the time to regenerate and heal in an organized way or without scarring. Here is the problem: this is a question that we faced 20 years ago when I began to study with some professors at Harvard How can we do research and understand how a fetus heals, to benefit adult blinded patients, without harming the baby? It seems there is no way you can resolve this conflict. If you are going to do research on babies to understand how the baby's tissue heals, then you will have to harm the baby in some way. But as Christians, we have moral, ethical principles. A baby is a human life. But if we don't do the research, then we may never have the opportunity to understand how humans can heal without scarring. It appears to be such a contradictory world, you know, fetal wounds healing so wonderfully-- but we can't do it, and just what is the solution? What was God's original intention? Did God really create a contradictory world? It was a problem plaguing many, many scientists for a long time. That is, until we discovered research by some scientists and a professor and started extending their research in the area of the amniotic membrane. It is a membrane surrounding an unborn child before birth that connects to the baby's umbilical cord. After caesarean section, the baby comes out and the sac and amniotic membrane is discarded. So even though it has the same healing characteristics as a baby's tissue, it was connected to the baby -- but is not part of the baby. Magically, miraculously, it has the same biochemical, biological properties that the baby's tissues have. So we started to do some research. The idea was if we transplanted the amniotic membrane, then maybe the secret would be in the membrane since it had the same healing properties as the baby before birth. So basically, after an injury, we started looking at covering one eye with the amniotic membrane to recreate a fetal-like environment. A magical thing took place. For underneath this amniotic membrane, the body, the adult body, the adult eye wakes up. It looks up and says, "Oh I guess we were wrong, we're not born yet." And it will reactivate the regenerative ability it used to have before birth in each of us. The body will start to heal without scar. Then we remove the membrane, two weeks later, and instead of seeing a blind, painful eye, you see clear vision. The best part as a Christian involved in the research at the time, was to find what was God's original intention. Here God gave us an opportunity and we stumbled upon it because we happened to have persistence and did not give up and did not accept a contradictory world. We still had the faith and confidence that God created a perfect world. It may have appeared to be contradictory and we didn't know what to do, because we didn't know better. (Before and after pictures of injured eyes are shown.) We had one patient who had been blind for 30 years, who had 15 failed conventional surgeries and was declared irreversibly blind. After the amniotic membrane graft, sight was restored. Another patient had a devastating autoimmune disease and had been blind for many years, and it was very painful. He was very interesting because at the time we only had amniotic membrane tissue from an African American individual, and this patient was a Caucasian person. So I told him, “John, we can transfer African American tissue on you if you want, or we can wait.” He said, “Dr. Wang, go for it.” He is now the only man of his kind walking on this planet - a white man with black eyes. As the amnio-membrane research developed we realized there were only a few qualified specialized surgeons and centers, but patients were getting injured everywhere all the time. We also found that we have to graft the membrane within 24 hours after the injury before the scarring process starts. How can we accomplish that? Only a few doctors can do the transplantation in specialized centers, but people need help throughout the world. Again, the faith issue comes. God does have solutions. It may not be apparent to us. We need to put a membrane on any injury within 24 hours anywhere in the world, but the surgical grafting technology and training will take a long time to spread, but we cannot give up. We have got to have faith and keep plugging away, trusting that God is going to reveal to us when we have truly done our homework. In this case - contact lenses were His answer. Our team discovered that if you affix the membrane under a contact lens and put it in a bottle then anyone who has basic medical training in an emergency room who can put a contact lens on a patient will be able to immediately start the regenerative scar-preventing process of healing. That became our solution to the problem. (Pictures are shown of the research paper written and the U.S. Patent for the invention.) So amniotic membrane contact lenses create a fetal like environment tapping the fountain of youth - reactivating the regenerative ability within each of us that we used to have before we were born, and it is part of God's original design to be able to advance science without compromising moral or ethical principles. I think God has created a world without contradiction. It may have appeared to be contradictory to us at the time because we did not know better. What we need to do as Christians and as scientists in this case, is keep the faith, work hard, and do our part and believe in Him and He will reveal Himself to us when He wants to. In this case we can truly advance science and research by understanding how the little baby heals, without harming the baby. With regard to my work in China, I go to China 6 or 7 times a year. Our system is called HC of China. It is the largest private eye hospital in China and a third of our resources are devoted to charity. In China charity and philanthropy are less prevalent than in the United States and I am often asked, “Why does the US have so much charity and people are more willing to give and a country like China much less?” Do you know what my answer is? Faith, or lack of. I feel that if one truly believes, one would then know and have the confidence that God is watching over you and that your duty as a human being is to help another human being. I am in some twenty countries per year traveling to lecture. When I am not here in Nashville there is no surgery; I stop all surgery because I want to do every surgery for my patients myself. The best way to demonstrate your responsibility to your patients is to do it completely yourself. This patient was the first bladeless Lasik surgery patient in China - the first one in 1.4 billion people. Chinese hospitals together with U.S. medical establishments, involving a team of doctors, are actively involved internationally in charity care guided by Christian principles. In various ways we have helped patients from 40 states and 55 countries, with doctors donating all the medical care. This is the story of Kajal an Indian child, about whom you might have heard. Two years ago Kajal was in Calcutta India. Her stepmother intentionally blinded her by pouring acid into her eyes. She became totally blind and was then abandoned in a train station. A Christian social work group called Society of Underprivileged People, or SOUP for short, rescued Kajal in the train station and found that she was severely damaged and totally blind. Again, guided by Christian principles and the loving hearts of Christian brothers and sisters, Kajal was rescued, and then the group began searching around the world for a surgical team that could restore Kajal's sight. They contacted many medical centers in the United States. After a year or so, they contacted us and we raised money and brought Kajal and her caretaker to the United States last year. We performed one surgery and improved her vision a little bit, but she still has several more surgeries to go over the next several years. Our foundation has a gala once a year to raise funds to help blind people see, with the doctors donating their services, and guess what we call the gala: The Eye Ball. At Eye Ball 2007 on October 7th, Kajal was our featured guest. Amidst all the beauty of ballroom dancing - Viennese waltz, ball gowns and tails - amidst all the beauty of God's creation, we all became quiet and listened to the words of Kajal who is five years old, realizing that her world at that time was without color, without sight and it was a dark world because she could not see. Further, we reminded ourselves of the preciousness of our sight and our need to help those who could not see. This is a picture of the first dance. (showing the slide) I am the organizer of the Eye Ball and over 100 other people stepped in to help Kajal. I was really amazed. Most were Christians. How amazing are the caring spirits that are helping this child in her courageous journey from darkness to sight, from all around the world. And all of the adults present in that ballroom were all strangers to Kajal because none of us were related to her. God is able truly to connect human spirits. That is the common link. When the ball started I stood up -- and I love dancing, and so lots of ladies were looking around wondering who I would ask to dance for the first dance. I walked across the floor and invited Kajal and she and I led off in the first dance of the evening. You can see in the picture that even though she could not see, she was still smiling and she was joyful. This is because even though physically she could not see, though we hope to restore that one day, spiritually she could. Finally the moment came when we gave the microphone to Kajal and she said she wanted to sing a song for all of us. So, in front of 400 adults, she sang a song called “Jesus Loves Me.” There were no dry eyes in the room. Conclusion I appreciate the opportunity to share with you today about my humble experience in becoming a Christian and also the lessons learned. I regard myself, in the spiritual path of walking with God, as nearly a child. I have so much more to learn from all of you. I spoke today about China and its ancient history, the Cultural Revolution and cultural holocaust, the status of Christians in China, as well as how I became a Christian through not being able to find answers in science, but rather finding the answers in God's teaching in Christianity, as well as the two lessons learned. I think the real challenge of being a Christian isn't asking God and getting what you want, but asking God and accepting what He gives us. Finally as a scientist and a Christian, especially in science sometimes things appear to be contradictory - do you do stem cell research, do you not do stem cell research. The world may have a contradictory solution, but as Christians we need to have a fundamental confidence that God has created a perfect world and we just have to plug along, have that faith and confidence in Him, and do our part and He will reveal Himself. These are a few lessons I've learned in my life so far as a Christian. As one of the few LASIK surgeons in the world today who holds a doctoral degree in laser physics, Dr. Ming Wang has performed over 25,000 LASIKs (including over 3,000 on doctors). He is a designated LASIK surgeon for ABC’s national hit TV reality show “Extreme Makeover. During the Cultural Revolution in China in the 1970s while he was a teenager, Ming played a Chinese musical instrument, the er-hu, in an effort to escape deportation to the poorest parts of the country and being condemned to a life of poverty and hard labor, a devastating fate that fell upon 20 million youth. 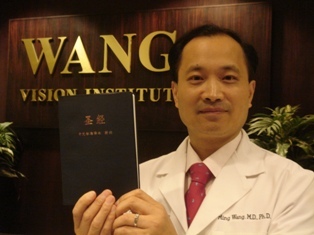 Arriving penniless in the US in 1982, Dr. Wang dedicated himself to study. He published a paper in the world renowned journal Nature, holds several US patents for his invention of new biotechnologies to restore sight and performed the world’s first laser-assisted artificial cornea implantation. He established the Wang Foundation for Sight Restoration, a 501c(3) charity which has helped patients from over 40 states in the US and over 55 countries worldwide, with all sight restoration surgeries performed free of charge. "God has created this world and it is without contradictions".